The regulations introduce Action and Limit values, compulsory health surveillance, weekly averaging and stricter monitoring protocols, this piece of law has more to it than might appear on the surface. There is also another major hidden issue not addressed by this legislation and one that industry must take into account and that is potential litigation; it is very often the case that complying with the regulations will only take you part way to protecting your organisation from claims! The legislation text can be downloaded from the HSE web site and a guidance book is available from HSE books, which is a must for anyone with potential Vibration risks. Getting a Grip on the Regulations! There is no substitute for reading the guidance notes in full or attending a competence training course, but this article will review the major points of the regulations and looks at a few specific issues that arise. The main thrust of this new law is to lower the acceptable levels of Vibration exposure, above which both employers and employees are required to take action. * Note that 2.8m/s2 is a dominant axis value whereas all other values are given as sum of squares of 3 axes. It may look like the new action value for Hand Arm Vibration of 2.5m/s2 is only a little lower than the old one of 2.8m/s2, however, this is not necessarily the case and it is more like an increase from 2.8m/s2 to 4m/s2! The techie explanation is below. The previous guidance gives an A(8) action level of 2.8m/s2, but this is a dominant axis value (simply the biggest value of 3 directions of measurement). The new regulations give the value as a sum of these 3 measurements so the two cannot easily be compared. A good approximation is to say that a dominant axis value of 4m/s2 could be compared to the new levels. For companies who purchased any equipment before 6 July 2007, there is an exemption from the Limit value until 6 July 2010. There is also an exemption until 6 July 2014 for the agriculture and forestry industry for the Whole-body Vibration Exposure Limit Value. Once again, care should be taken as using these derogations is no defence in a civil claim! There is now a specific regulation allowing vibration exposure to be averaged over a working week. This means if an employee is exposed to high levels on just one or two days, then averaging over a week will reduce the calculated exposure level. Care should be taken when applying this and it may well be worth asking your HSE contact the best way to use it, if at all. The new guidance states that measuring the actual vibration levels may not be necessary. The theory is that information on the levels of vibration emitted by most equipment should be readily available from manufacturers, on web sites, in shared information or in databases. There is a problem, however, with not taking measurements and it is one that is recognised by many industry specialists. The problem occurs in producing evidence in defence of civil claims. Without measurements, there is in practice, no defence, leading to successful claims and huge potential costs. The reason this is not written into the regulations is that the HSE do not have a remit covering civil matters. Measurement technology is improving all the time and meters such as the Castle Pro-DX Excieo can give competent, reliable measurements with minimal training. For Hand-Arm Vibration, the effect of PPE is minimal to say the least with the potential that it can actually make matter worse! The reason is that gloves are only effective at reducing high-frequency vibrations, when it is low frequencies that cause the damage. Techie bit: If you want a reason for this, then physics has the answer; low frequency vibration contains a lot of energy and so to absorb this energy, there must be a considerable mass of absorbing material. Building this mass into a glove would simply render it un-wearable as it would seriously constrain the level of dexterity of the wearer. For Whole-Body Vibration, PPE would certainly be interesting (images of padded trousers come to mind!) although, once again not practical and not effective. There is however, usually quite a lot that can be done with the seat or the platform (transmission through the feet) to reduce the vibration reaching the person. Any employee likely to be exposed to above the action value for either HAV or WBV must be placed under ‘suitable’ health surveillance. This can take the form of either screening or ‘objective testing’. Screening normally involves a questionnaire to gather information about previous work, hobbies and pastimes, indications of pre-disposition to injury and other such information. This might be carried out pre-employment and then at regular intervals dependent on the level of risk and susceptibility factors. ‘Objective’ testing usually involves sending an employee to a medical centre and is a lengthy and costly test to conduct, so is usually only used for high-priority cases. Whole Body Vibration is a different matter and as yet there is no ‘objective’ test available to identify injury caused by vibration. The approach adopted by the HSE is that problems such as back injuries should be viewed holistically, taking into account ergonomics, manual handling and vibration as all potential causes. Having looked at what the regulations have in store, it is a good idea to mention some of the fundamental bits that people often find it hard to understand. The term Aeq simply stands for the Acceleration equivalent value. Acceleration is the vibration parameter used in human vibration measurements and is measured in metres per second squared (m/s2). The ‘equivalent’ part of the term simply means the average vibration level. Techie bit – Aeq is a single number that represents the equivalent energy of a varying source. In other words you get the same amount of energy from the varying vibration level as you would from the continuous, equivalent value. The main actions required by the law are based on assessing a daily vibration exposure figure – written as A(8). This is an often misunderstood, yet fundamental point, which if not observed, will invalidate any risk assessment. In fact, vibration exposure is just like any other form of exposure, for example, dust, gas, radiation and even sunlight. To take Sunlight as an example: if the average strength of the sun is measured over the course of a day (call it 8 hours), this will give a figure showing how strong the sun is. This does not, however say anything about how brown (or burnt) a person might get as this, in turn depends on how long they stay in the sun. If the sunbather spends 4 hours in the sun, then they have had half of the available sunlight so it would be logical to take half of the number as the exposure figure. The same principle applies to vibration exposure, where Aeq is a measure of the level that exists at the surface of a tool or seat. This can be measured using a Human Vibration Meter such as the Castle Excieo. The A(8) is then the proportion of that Aeq relative to the time of exposure. There is a formula to calculate this as it is not simply a direct proportion, but the principle is the same. 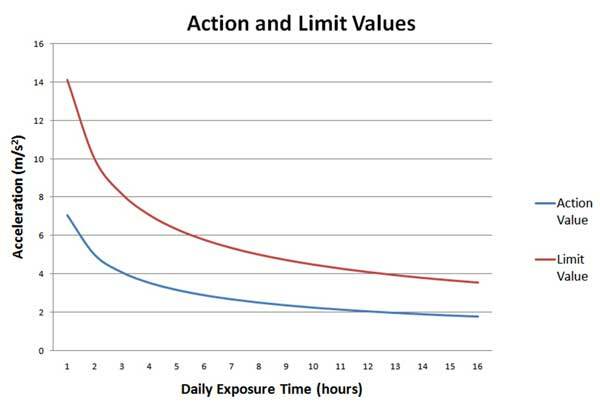 The relationship between the measured level (Vibration magnitude) and time spent exposed, for both the action value and the limit value, can be shown as follows. It is absolutely imperative that the measurement pick-up (accelerometer) is rigidly fastened to the surface of the tool handle. The very best way to do this would be to drill and tap a hole and fix the accelerometer directly; this doesn’t usually go down too well with the boss though! Failing that, fast-setting epoxy glue or jubilee clips should be used. Cable ties are a last resort and only ratchet-less ones with a tightening tool should be used if absolutely necessary. Watch out for overload or under-range messages. An overload message will occur when the peak of a vibration waveform exceeds the capabilities of the instrument to measure (see figure 3). This leads to a loss of measurement information and therefore errors; if this occurs then the measurement must be taken again. An under-range message will occur if the actual measurement reading (rms) falls too close to the electrical noise within the instrument circuits, this also causes an error. 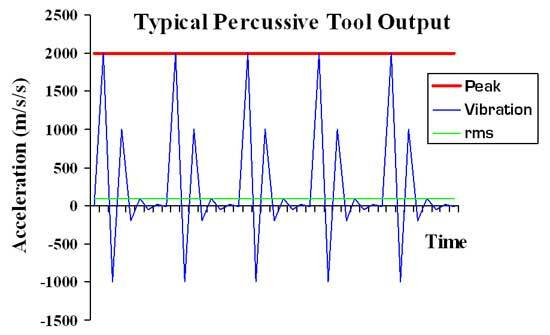 As some percussive tools have a huge difference between the peak and rms (see figure 3) it is possible to encounter both states at the same time. This is especially true with older technology instruments. The changes brought by this new set of regulations are not necessarily profound (apart from a fairly large change in the action levels!). There is, however a lot of detail and many small changes from the existing position, which require care in implementation. The guidance on regulations from the HSE should be read and digested and it may well be wise to attend a ‘Competent Person’ training course for Vibration at Work assessments. This legislation is written from the point of view of the HSE, whose primary concern is with the protection of employees who are exposed to excessive Vibration levels. What they are not concerned with is civil litigation. In other words, as long as an employer is taking enough action in the eyes of the HSE to prevent injury to people from excessive vibration levels whilst at work, they will be happy. The problem is that this may well not be enough to mitigate any claims that come along in the future!